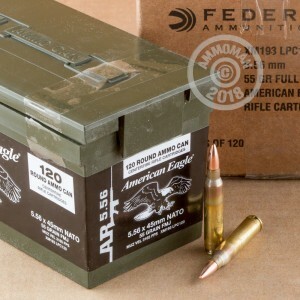 This pack of 5 ammo cans is the perfect companion for your next range trip with your AR-15 or other .223 Remington. 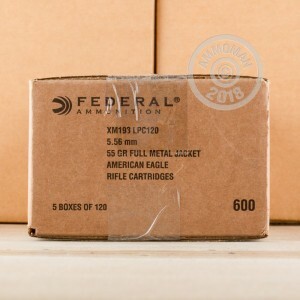 Each of the 600 cartridges in this case is manufactured at the Lake City Army Ammunition Plant on the same production lines that supply the US military. This ammo follows the M193 ball standard and fires a 55 grain full metal jacketed bullet with a boat tail for added stability and wind resistance. Like all Lake City ammo, these cartridges use non-corrosive Boxer primers and brass casings with annealing marks left intact. 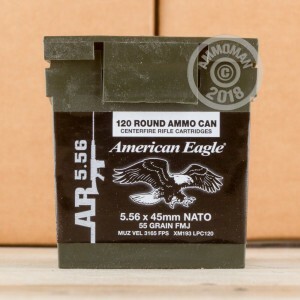 Due to its military provenance and excellent reputation for quality, Lake City surplus ammo (produced under contract by Federal Premium Ammunition) enjoys strong market demand at all times. Grab your case now and take advantage of AmmoMan.com's sitewide free shipping for all orders over $99.